The endlessly repetitive door slamming, the stair stomping and the sulks. Trying to translate their exasperated sighs into meaning. The sudden unilateral annexation of the bathroom. Their ever shortening school skirts. That improbable eyebrow phase. Their insistence on wearing metre thick foundation in a shade twelve times removed from their own skin. Oh, and the lengthening parade of slack-trousered youths hanging around the back door, grunting occasionally. It's enough to drive a mother to drink. Or *cough* to even more drink. 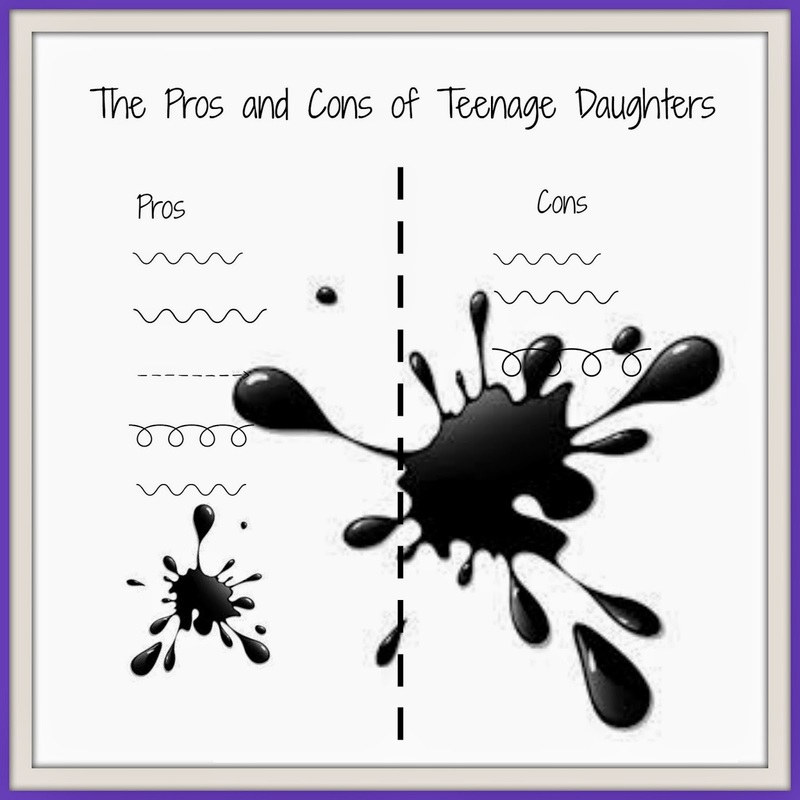 The Pros and Cons of Teenage Daughters. Pro: You've always got someone to go shopping with. Con: Though you will end up coerced into buying entirely unsuitable clothes that they will instantly claim as their own the minute you arrive home. Pro: You've always got someone to send to the shop. Con: They're quite likely to bring back what they want, rather than what you sent them for. Pro: You've always got someone to watch a chick flick with. Con: They find your crush on Colin Firth hugely hilarious. Pro: You can buy the latest Tom Daley calendar and claim it's for your daughter. Con: They will announce loudly and through all social media channels that you really bought it for yourself. Pro: You can borrow their shoes. Con: You have to, because they've stolen all yours. Pro: They offer to do your hair and make-up before an evening out. Con: You look like you're going to Halloween party, in June. Pro: You can swear in front of them as much as you like because they've heard much, much worse from their friends. Con: They know more swear words than you do. Pro: You have someone to share your life experience, wise thoughts and considered advice about life and love with. A bright side? Well, um. No, not really. Haha fab and oh so true from what I remember as the teen days!